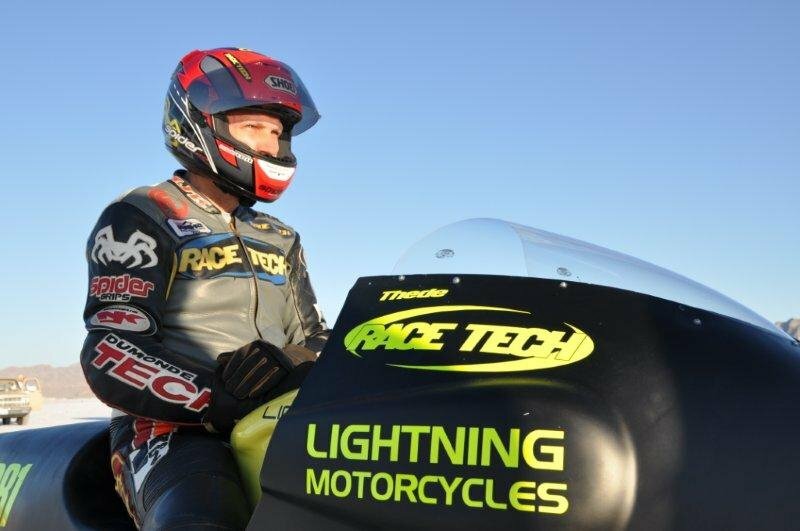 Paul Thede made history when he became the first to break the 200 mph barrier on an electric motorcycle and set the new land speed record in the process. Not only is he officially the first to break 200 but set the bar pretty high with a record setting pass of 218.6 mph. ►Read More! Land Speed Record Bikes require special and meticulous chassis setup. 1000 hp is worthless without traction (oh yea, the bike has to go straight too)... Race Tech has years of LSR suspension and chassis development available to benefit your record runs. Contact Race Tech to have your suspension setup and chassis aligned with our ►Scheibner Mega-M.A.X. In 2011 at the Bonneville Salt Flats Paul increased his record speed run of last year where he topped the charts at 173 mph on a Falkner/Livingston Racing / Dumonde-Tech / Lightning Electric Motorcycle. This year the team bumped the record up to 215.960 mph with a single pass at over 218.6 mph! Not bad for an engineer! I guess we can't call him "slow" any more! Paul riding off into the sunrise. Buy our Gold Valve Kits, Hi-Performance Springs, and Ultra Slick Suspension Fluid and install them yourself. (If you get stuck call Tech Support 951.279.6655.) Hey, if you're really into it check out our Suspension Seminars.